Baroque Gestures, strictly applied or modified to greater or lesser degrees, are appropriate for stage-works generally, from 1600 - 1940. With Romanticism of the 19th century, baroque gestures were relaxing with increased naturalism, however, to judge from contemporary prints of actors', modern realism was still very far away. 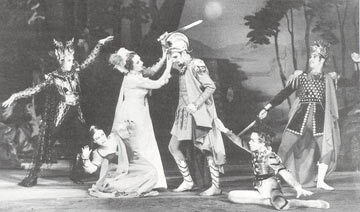 With the end of the second world war in 1945, and with successful amateur soldier-thespians returning home, the professional classical acting technique of previous centuries was soon buried by enthusiastic amateur-turned-professional performers - Realism came to stay. In the third picture (certainly not amateurs) the passions are thought rather than displayed! In England, as much as one can perceive the progress forward from the baroque style, one can also discern the development of baroque style before 1650. It is not unreasonable to propose that Shakespeare's tragic actors in 1600 would have looked not vastly different from Dryden's in 1700. 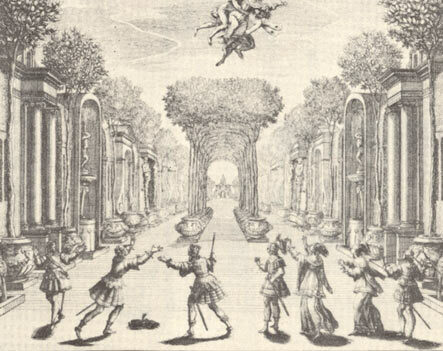 After all, Italian performances saw the start of baroque staging and acting style in 1600.